Warp: Fun, If a Little Flawed. When I started out with this idea of doing 1 review a week it was mostly because I always seemed to find myself with a backlog of big name titles to play through. There aren’t however enough titles like that to sustain that kind of pace throughout the year and for the first 3 months of this year most of the titles I was reviewing were actually things released last year that I hadn’t got around to playing. Consequently I’ve found myself playing a lot of games that I wouldn’t have otherwise given a second thought to and Warp, the action-puzzle-stealth hybrid from Trapdoor, is one of those titles that I wouldn’t have considered playing. Warp has you playing as an oddly shaped alien who’s named Zero (something I don’t think was made clear in the game, I certainly can’t remember anyone saying his name) waking up in an undersea laboratory. You’re surrounded by scientists who begin to perform surgery on you to remove a disk shaped object from you which turns out to be your internal power source. After a short obstacle course, which serves as the tutorial for the basics of the game, you are then reunited with your power supply and regain your ability to teleport short distances. Warp flows on from there, following Zero’s quest to escape the confines of the laboratory. On first appearances Warp isn’t too much to look at, mostly due to its roots as a Xbox Arcade game. For the actual game play the graphics are fine with Warp making heavy use of lighting effects to cover up their less-than-stellar models but the cut scenes unfortunately didn’t appear to get any extra treatment to make them any better. Thus the artwork, graphics and sound work are all around the level I had come to expect from say around 5 years ago when I had friends tinkering with 3D models. Sure I can understand that there are limitations thanks to the target platform but when you don’t even bother to try and do rudimentary lip syncing for dialog scenes I get the feeling that a lot of this was done due to budgetary constraints rather than a lack of technical ability. The core game play of Warp revolves around Zero’s ability to teleport short distances and also hide inside objects and people. At first it starts off with rudimentary things like finding non-obvious was to get around your environment but as the game progresses the challenges start to scale up dramatically. Zero also gains additional abilities as you complete levels augmenting himself with things like producing a controllable decoy (so you can get guards to kill each other), using said decoy to swap places with other objects and being able to launch objects a great distance. The combination of all these abilities makes for some rather interesting puzzles, some that are actually quite challenging to figure out. Also thanks to the integration of a half decent physics engine there’s actually the opportunity for a lot of emergent game play which makes it a whole lot more interesting than your rudimentary puzzle game. Since every object can be moved and flung around quite easily there’s a lot of opportunity to break the intended solution by bringing objects along with you that the game doesn’t expect you to. There are also times when it goes horribly wrong like the travelator towards the end that you can change the direction of, try destroying both power supplies. The animation stops but you’ll still move if you stand on it. Still problems with the physics based game play are thankfully few, although Warp is far from free of issues. Scattered throughout the game are challenges like the one above that push your use of certain skills to the limit in order to get extra “grubs” that are used to upgrade your abilities. These are usually timed affairs and in the words of someone I can’t remember “You know how to make something not fun in a game? Slap a timer on it.” and that’s exactly how all these challenges feel: not fun. I probably spent about a fifth of my in game time trying to get better than bronze on these challenges and I managed to get a few of them but at no time did I have fun doing it. It was kind of like Super Meat Boy all over again where the replay value is derived from it’s rather frustratingly hard difficulty. Not all of them were like this but the initial ones definitely were and it’s likely that it’s me being retarded, but there is another reason why I think its not. The game is a very obvious port from Xbox360 to PC and that brings with it all the issues that are usually associated with them. For starters whilst the mouse is available in the initial start up screens it doesn’t work in the actual game for anything, not even the upgrade menus. Instead of redesigning the control paradigm around the mouse and the keyboard all the interface controls are simply remapped to the keyboard. This means that sometimes the game engine expects input in a certain way and doesn’t get it which can lead to all sorts of unintentional behavior. It’s not game breaking once you get used to it but it does smack of lazy porting just to grab another market. 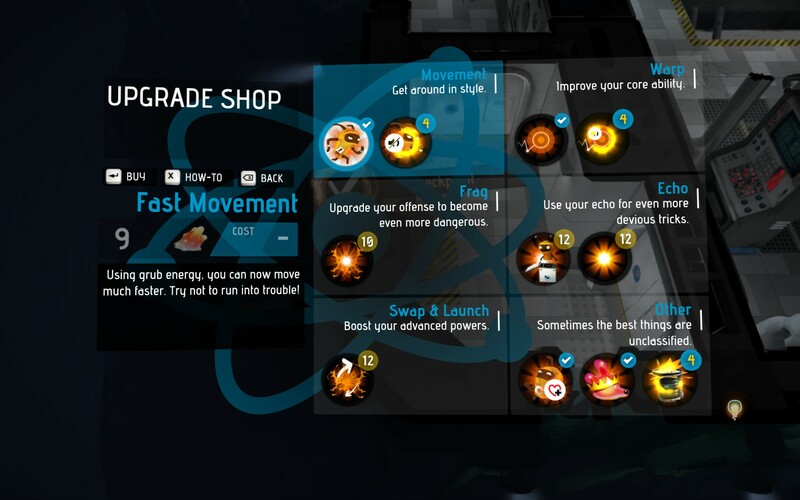 The upgrade system is interesting at first glance, being able to augment your abilities in ways that change the game play significantly. As you can see above I chose to invest my grubs in certain keys skills, namely the ones that form the basis of the core game play (teleporting and moving faster). These definitely made the game somewhat easier as there were many times I could fudge my way through or get out of a situation that I wouldn’t have been able to do otherwise but looking over the other skills I couldn’t be sure why anyone would get them or how’d they make the game easier. In fact I played the majority of the game sans these two skill upgrades mostly because I didn’t bother with the challenges nor religiously tracking down grubs in order to get said upgrades. This isn’t a problem with Warp per se, more the with the idea of combining a puzzle game with an upgrade system. For all the main challenges you’re going to have to give the player the required skills anyway and all the upgrades then can really only be making the player’s life easier. Deus Ex: Human Revolution did the upgrades that unlock other potential pathways/secrets bit quite well but they still had to accommodate for the possibility that the player didn’t choose a specific upgrade, at least for story critical sections. All of Warps sections appear to be story critical though, rendering the upgrade system kind of moot. All that being said however I still found Warp extremely fun to play. I’m not sure how I’d describe it but the combination of puzzle solving, the over the top reactions from NPCs when they spotted you and the decidedly dark enjoyment you get from making people explode from the inside out made my time with Warp very enjoyable. This is in spite of the story that’s so thin on the ground that it might as well not even exist in the first place, something which indie games like this don’t usually forgo. Considering this game can be had for $20 as part of a 5 pack of games I think it’s incredibly great value for the time I spent with it and would recommend giving it a shot. 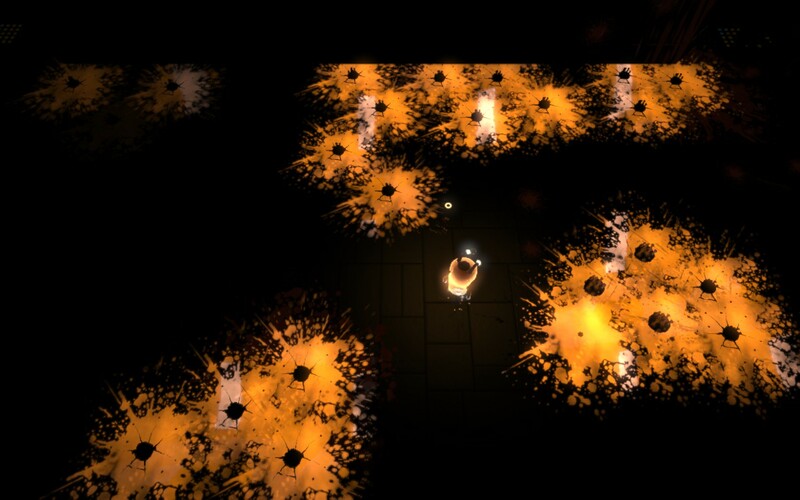 Warp is available on PC, PS3 and Xbox360 right now for $9.99 or equivalent on all platforms. Game was played entirely on the PC with around 5 hours of total play time and about 2/3rds of the grubs found.